Having travelled the nation of Brazil for 21 years I have seen many transitions. Beginning from my work with the brothers in the Methodist Church where I recall our glorious experiences as many would be baptized in the Holy Spirit, speak in tongues. I remember how many transitioned into the Pentecostal/Charismatic season where we were witnesses of great manifestations of God as signs and wonders followed us everywhere. Who could forget the manifestation of gold dust or the manifestation of oil or the eyes of the blind woman being opened or the many women who were barren who were delivered? These continual accompaniments of the miracles of God ensured my continued passion for this nation. About twelve years ago God ushered His people into the apostolic/reformation season where the emphasis shifted from the believers being fixated on the manifestations to studying the doctrine of the apostles which placed a great demand on the reformation of the church in accordance to the pattern that is established by the early church in Acts 42. This clearly defines the four building blocks of any ministry. And now, here we are, standing at the threshold of yet another season in God. We call it the “post apostolic” season. Functioning from a spiritual Zion….God’s Holy Mountain. This is clearly a season to build and to plant. The calf and the young lion and the fatling together; And a little child shall lead them. What a great expectation! What great joy! 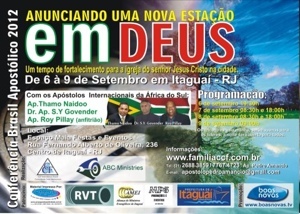 We announce this new season in God!